The gunfire on the streets near my hotel started around 9pm last night. The sound is unmistakable, especially at night on an otherwise quiet city street. I had recently returned to the hotel after a few evening meetings. And coming back after dark it was as if they had rolled the sidewalks up — restaurants with no patrons, bars and clubs that were totally empty. There was an incredibly striking woman I remember, standing in front of her restaurant playing hostess to absolutely nobody. And with few people on the streets, it felt like some sort of zombie apocalypse. Amazingly enough this country used to be THE wealthiest in the region. And not too long ago. Throughout the 1950s, 60s, and 70s, Venezuela enjoyed robust growth. Low inflation. Substantial foreign investment. High wages. It was the envy of Latin America. It was all based on one industry: oil. Venezuela has effectively been a one-trick pony for decades. And when oil prices were strong, the government was swimming in cash. Even as recently as 2007, the Venezuelan government’s oil revenue was so high that they PAID OFF ALL FOREIGN DEBT. Think about that: only ten years ago Venezuela had ZERO foreign debt. But at the same time the government here had a long history of excessive spending. Social programs. Military. Fuel and electricity subsidies. Whatever it took to remain in power. The government spent so much money that, even when oil prices exceeded $100 per barrel between 2011 and 2013, they STILL couldn’t break even. Then oil prices collapsed. By early 2016, a barrel of oil was fetching less than $30. 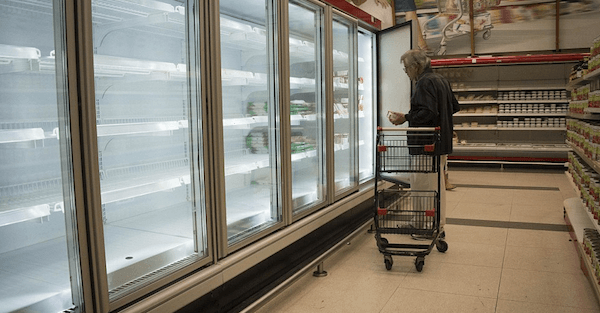 Venezuela’s public finances were in shambles… so the government resorted to the same old tactics that nearly every bankrupt government has relied on throughout history. For one, they started spending their foreign reserves– essentially burning through the public savings account. Today Venezuela has its lowest level of foreign reserves in decades, less than $10 billion, compared to $42 billion in December 2008. They’ve also sold off a huge portion of their gold reserves. In late 2015 Venezuela held 373 metric tons of gold. Today that’s down to 188 metric tons, a nearly 50% drop in less than two years. More importantly, though, the government has resorted to printing incomprehensible quantities of paper currency and vastly expanding the central bank balance sheet. This chart is really amazing to see– the Venezuelan central bank’s balance sheet literally TRIPLED in a SINGLE MONTH between April and May of this year. They keep printing more and more money, to the point that the currency has become totally worthless. I remember coming here a few years ago when the black-market rate was around 8 bolivars per US dollar. 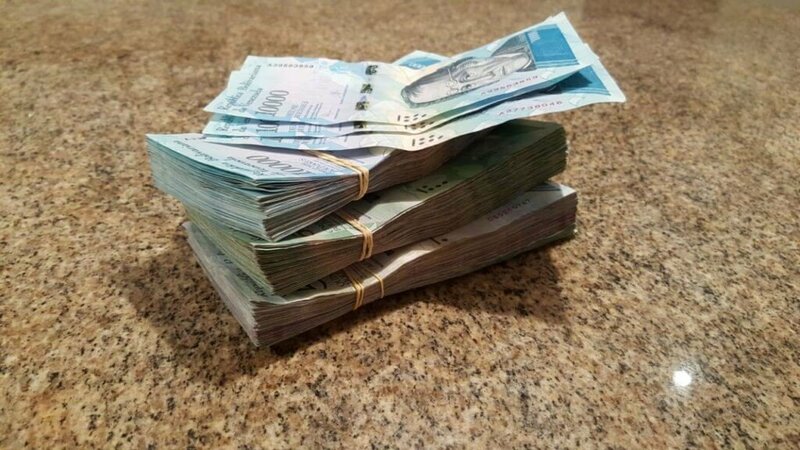 On my next trip, it took 100 bolivars to buy a dollar in the black market. And the rate kept dropping with each trip. This time I exchanged dollars at around 27,000 per US dollar. Meanwhile the ‘official’ rate is a laughable 10:1. It’s a nearly 3000x difference. So, depending on which exchange rate you use, Venezuela is either absurdly expensive or absurdly cheap. A ride from the airport was about 80,000 bolivars. At official rates that’s EIGHT THOUSAND DOLLARS. For a taxi ride. But at black market rates it’s less than three bucks. Quite a difference. Last night I exchanged $100 and received this brick of cash in exchange. Needless to say this monetary insanity makes life extremely difficult. Anything imported is prohibitively expensive. And with the economy collapsing, domestic production is also grinding to a halt. There’s very little economic activity. People are sitting in their homes trying to survive. Medicine is scarce. And even staples like food are running out… which is totally nuts. Venezuela is a vast country with rich, fertile soil and abundant sources of water. There is absolutely no reason why there should be food shortages here. Chalk up another victory for socialism and central planning. In their desperation, people are turning to crime, prostitution… anything they have to do to make ends meet. I routinely see people picking through garbage cans eating scraps, anything they can find. Incredibly there is still a hint of normalcy in the city, at least during the daytime. People are out on the streets going about their lives… heading to work, taking their kids to school, playing sports, chatting with their friends. I find it remarkable how well this place has held itself together. Venezuelans constantly display ingenuity and resilience in their ability to deal with such an epic crisis. And the good news is that this will one day get better. The government has nearly run out of money and is dangerously close to defaulting on its debts. At some point they’ll no longer be able to pay the armed thugs who keep the population in line. It’s inevitable. Totalitarian governments almost invariably fall when they run out of resources to sustain themselves. It may get worse before it gets better. But eventually this madness and oppression WILL come to an end, whether through war, revolution, peaceful means. What I find so strange is how little optimism there is for Venezuela. By comparison, investors are perennially excited about Cuba. People have been saying for decades that Cuba will be an investment paradise once the authoritarian regime comes to an end. Sure, great. I’ve been to Cuba. I like it. And there will certainly be great opportunities there. But few people apply this same logic to Venezuela. And I find that strange. This place is huge. There is SO MUCH opportunity here. 30+ million people. Enormous reserves of natural resources. Plenty of coastline. Ports. Infrastructure. Manufacturing capacity. Strategic geography. Renewable energy. Whether it’s next year or ten years from now, this country has the potential to some day become one of the most exciting places in the world.